How many wellness apps have you seen in the App Store? You might even develop such apps by yourself. The popularity of wellness apps can be gauged by the fact that self-care turned out to be the app trend of 2018 on the App Store. Top iOS apps, like Headspace, Calm, Shine, Fabulous, and 10% Happier have extended their offerings from merely aiding sleep and encouraging healthier lifestyles to placing the end users’ mental and emotional well-being at the center of the app experience. Such apps have successfully adhered to Nir Eyal’s principles on building habit-forming products, leaving users “hooked”, gradually becoming a thread in their daily functional fabric. Let’s now learn how a popular self-care app is using great UX and effective mobile marketing to create a niche for itself. I am talking about Headspace. Valued at over $330 million, the app has over 30 million app downloads with over a million paying subscribers. In this guide, you’ll find a detailed breakdown of what Headspace has been doing right to fuel exceptional user acquisition, engagement, monetisation, and retention. These are key lessons that you can repeat for your own app as well. Headspace has been able to ace its App Store Optimisation Strategy (ASO) by working hard on the following components. (i) App Icon: Headspace keeps things simple with its icon, creating a lasting impression at first glance itself. This must have been finalised after multiple rounds of testing during its early days. Remember that your app logo must create instant brand recall without being “too smart” or overly complex, as screen space is limited post app download. (ii) App Name and Sub-Title: Just as is the case with Search Engine Optimisation (SEO), it is important for apps to get their keyword strategy bang on, when it comes to the app name and sub-title. This is based on the relevance, difficulty, and traffic of the target keywords. Words that adequately describe your app’s industry, value proposition, and user benefit work best. Headspace gets this right by using keywords that are easier to rank for. Searching for relevant keywords such as “sleep app” or “meditation app” shows Headspace in the top 2 results in the App Store. In fact, searching for “calm”- a major competitor - shows Headspace on the 2nd position. By including high search volume keywords such as “meditation”, “sleep”, and “breathe” in its app name and sub-title, Headspace achieves higher discoverability and increases the chances of potential users landing on its App Store page. (iii) App Rating and Reviews: Ratings and reviews serve as consumer word-of-mouth testimonials. These can often make or break an app’s chances of user download. With an average app rating of 4.7 and a sizable number of ratings provided, Headspace conveys a sense of trust and value, further boosting chances of the app download. (iv) App Store Page Description and Preview: Headspace uses quirky copy and engaging images, in addition to a video snippet, to effectively communicate the value that potential users would benefit from. This messaging instantly sets itself apart from competition and positions it as a brand that really cares about its customers, wanting them to be better versions of themselves. By revealing details regarding its different subscription plans, Headspace ensures a high degree of transparency right from the start. Other important details are the app version and when it was last updated. 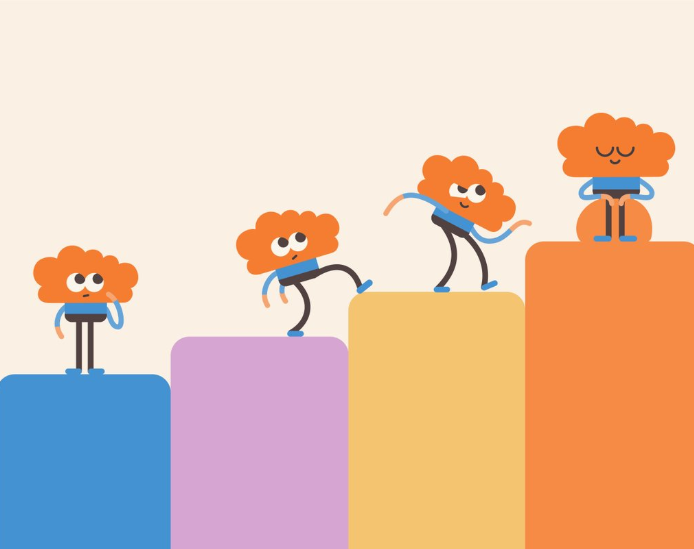 It highlights the fact that Headspace is constantly working to deliver the best possible user-friendly experience at every stage of the app user lifecycle. All these factors collectively influence a positive app download decision. An effective onboarding flow sets the tone for future app usage. It is your chance to create Aha! Moment during the first time user experience (FTUE). Headspace follows the 3S Principle of App User Onboarding - Short, Simple, and Seamless. The welcome message - “Show your mind some love” remains static. Headspace makes this stage more engaging with its auto-carousel images that make users visualise themselves in those different situations. Headspace makes the onboarding process faster by offering first-time users the chance to sign up with an email address of their choice or through social login. Social logins are known to make the onboarding flow more frictionless, reducing the chances of drop-offs by over 55% at this stage itself. By enabling users to quickly create an account, Headspace captures all relevant personal information to begin creating a user persona at the backend. The moment a user signs up, he/she is greeted with a personalised message on the next screen, nudging to move further along the usage funnel by gaining greater insights into an onboarded user’s preferences. This lays the foundation for delivering more personalised experiences in the future. Post this, the user is free to explore and experience the app. (i) Leverage in-app messages during onboarding: Headspace could trigger an in-app message on first-time app launch, encouraging users to opt-in to receive push notifications. This can be made more effective by clearly communicating what sort of content would be “pushed” to users. Eg. mindfulness thoughts, habit-building alerts, monthly subscription payment updates, etc. Push notifications can increase user engagement by over 85% and user retention rates by 2X, becoming an important channel of mobile engagement in the long run. (ii) Help first-time users navigate through the app better: Headspace could benefit by offering first-time users helpful simple drop-down tips, directing them to key features and service offerings. This fits into the entire onboarding flow and often fast-tracks the movement of users along the most common paths to conversion. This is something that Headspace’s competitor, Calm, excels at. Of course, this has to be done in the most non-intrusive manner possible without handholding new users too much! 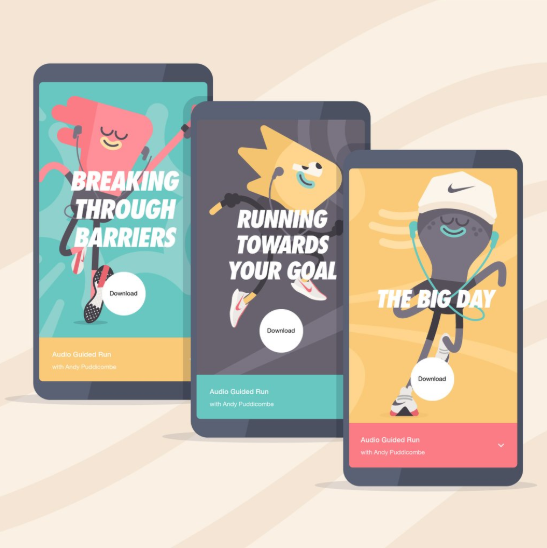 Headspace banks on its unique soothing colour palate and visually impactful caricature-like personas to create a memorable user experience. The app is easy to navigate once you get your bearings straight, reducing the chances of drop-offs. Unlike Calm that keeps nudging you to upgrade to a paid subscription plan, Headspace allows users to make that decision only when you have experienced enough value through its app. With a host of self-help modules - ranging from mediation and sleep to personal growth and anxiety relief - Headspace ensures that there is something for everyone. The app subtly nudges users to identify their pain points and start their personal wellness journeys through therapeutic tips, mindfulness recommendations, and audio content. The element of gamification adds a habit-building dimension to every personal user journey. This helps increase app relaunches, average in-app session lengths, app stickiness, and 90-day user retention in the long run. What could Headspace have done better? (i) Offer access to more content for free: Remember the Principle of Reciprocity? 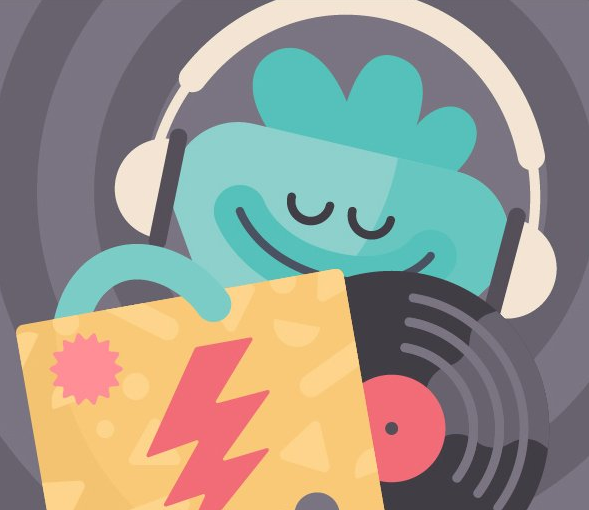 By offering up access to greater relevant content and complete app features - for free - Headspace could nurture a stronger relationship with freemium users. This can help in eventually convincing them to become paying subscribers down the line. This also opens up greater monetisation opportunities and reduces the chances of app abandonment and churn. (ii) Leverage the power of community building: Headspace allows users to “Add a Buddy”, a referral programme that helps with user acquisition. In addition, the app could benefit by helping users build in-app virtual communities (or, groups) suited to their preferences, especially for activities such as meditation, fitness, outdoor sports, stress relief, etc. This feature could be made more effective by allowing users to join or form communities based on geolocation data and recommendations, creating a greater sense of belonging. While individual self-care goals are important to the overall journey, we, as humans, often derive greater strength in numbers! Given the app category that it operates in, centred around peace of mind, Headspace has made a conscious decision to adopt a very simple push notification strategy. The content is a mix of mindfulness tips, philosophical quotes, habit reminders, health-related recommendations, app-specific suggestions. While the push notifications are not annoying (Headspace also allows users to manually cap the number of messages they receive in a day), there is a lot of scope for improvement that can optimise Headspace’s mobile marketing spends. (i) Personalise the messaging: Personalising push notification content can elevate open rates by 4X (vs. generic content). It isn’t merely limited to addressing users by their first name. Instead, personalisation involves leveraging a unified view of users to tailor-make content based on their demographic, geolocation, and in-app behavioural (historical and real-time) data and actionable insights. For instance, a user on his/her meditation journey could receive personalised push notifications such as helpful tips, “pick-up-from-where-you-left-off” nudges, and module updates. All of this also requires intelligent data-driven user segmentation. Most of the current push notifications are impersonal, driving down the chances of opens and app relaunches. (ii) Experiment with rich elements: Successful mobile marketing is a lot about A/B Testing and campaign optimisation. Instead of sticking to plain vanilla text-driven push notifications, Headspace could experiment with the use of rich elements such as images, emojis, audio, videos, or GIFs for certain campaigns. With only 8% of mobile marketers actually embracing rich push notifications, it allows leaders like Headspace in evolving app categories to test the waters. Rich push notifications are known to increase open rates by over 55%. For instance, users who are harnessing Headspace to regulate their sleep patterns could receive a contextualised rich push notification with a GIF or audio promoting the latest “Sleep Story” added to its library. (iii) Deliver push notifications in the user’s timezone: With users across 190 countries, Headspace could benefit by improving its user segmentation and delivering messages based on its users’ timezones. Regardless of how personalised and relevant the message content may be; it defeats the purpose if a user receives a push notification when he/she is already asleep! Headspace could also leverage the power of Machine Learning to optimise its send-times for various engagement campaigns, based on the historical response of its users. A segment of users that has shown a common trend to respond to push notifications at a certain time of the day should be engaged with at this optimal time. This increases the chances of higher clicks and app relaunches. This can lay the foundation for a more effective predictive app marketing strategy, resulting in higher user engagement and retention. Headspace recognises the need to use a multi-channel marketing automation approach in order to improve on its key mobile app metrics. Which is why it relies on different engagement channels such as push notifications, in-app messages, and email. I’ve been particularly impressed by its email outreach, something that definitely gives it an edge over competitors such as Calm. The body content and creatives are quirky and memorable - an effortless extension of its brand persona. This results in better open rates and clickthrough rates (CTRs). The campaign objective of every email is clear to the recipient with a strong Call to Action (CTA). For instance, the campaign objectives vary from welcoming new users, nudging them to get started on their individual journeys, and promoting subsidised subscription packages. These are all aimed at encouraging users to relaunch the app and start their individual wellness journey. (i) Leverage dynamic content for personalisation: Personalised emails, based on user’s demographic, geolocation, and behavioural data, could help Headspace boost CTRs by upto 14%. This is based on the same principles as push notification personalisation, but could help Headspace expand its messaging in emails. (ii) Optimise subject lines and content: Catchy subject lines directly influence open rates. Subject lines offer you a couple of seconds to grab the attention of users. By leveraging Machine Learning algorithms based on users’ historical interactions, email opens, and sentiment analysis, Headspace can identify high-conversion keywords to use in its email subject lines and body content. Generally, research shows that users are more likely to respond to highly positive or negative keywords, leveraging a sense of FOMO (Fear of Missing Out), especially for promotional content. (iii) Focus on primary inboxing: When it comes to email marketing, brands will always benefit by delivering their emails under the “Primary” tab instead of the “Promotions” tab of their users’ inboxes. Currently, all of Headspace’s emails go straight to the “Promotions” tab, decreasing visibility, especially in Gmail. By adopting AI-based dynamic delivery, Headspace could drive up open rates and conversions by delivering a larger percentage of its email campaigns directly into users’ primary inbox. Then again, all of this depends on the multi-channel marketing automation objectives of Headspace! The lessons learnt from Headspace’s UX and mobile marketing strategy highlight how it's important to constantly think about your users. Do use these powerful tactics to deliver more satisfying customer experiences at scale, especially if you’re working on a self-care app.